What's The Best TV For Your RV? What’s The Best TV For Your RV? The RV life is all about spending your time outdoors and making the best memories. However, you will need some entertainment. Catch up with celebratory gossip, watch your favorite TV series (GOT anyone?? ), and play cartoons for the kids. If you are thinking to install your old CRT TV in your RV, that probably is a bad idea. They won’t work when you are driving, especially if the ride is a bumpy one. They don’t have an anti-glare finish, which makes it difficult to watch during the day. The TV is a risk in itself because it might fall on someone and it won’t be pleasant. You can go for a 12-volt TV if you have a small RV. You can install two of them, and each person can enjoy their favorite show. If you plan to go for a larger television, don’t go for anything bigger than 21”. You can purchase an RV TV antenna to watch local channels after you park for the night. It is an essential part of the setup because you need to check the news regularly for local updates and weather forecast. The best thing about RV TVs is that they come with built-in TV receptors. You can still add an antenna for better reception, or you can purchase channel streaming services including Dish Network and Direct TV. An RV TV DVD combo is another great choice, but only you watch TV series and movies on disc and don’t want to invest in a satellite or any streaming service. Many RV parks offer free TV hookups, which you can use for free after parking for the night. Once you plug-in, you have access to more than 100 channels. When you start looking at options, make sure the RV TVs offer all these features. The RV TV you choose should have a resolution of at least 1080p. Higher the resolution, the costlier the product will be. If you don’t want to pay a premium price for something you won’t be using frequently, you can settle for 720p, which is a much more affordable option. Sound quality is an important feature because you’ll be on the road and there will be a lot of traffic around. You should be able to listen to what’s playing on the TV clearly. Purchase a TV with six-watt speakers as they cancel noise well and remove static as well. Check the electricity lines of your RV. Most televisions nowadays are only AC-compatible, so if you have a DC connection, they won’t work. However, if you have an AC connection, there will be no issues. There are three elements that affect the picture quality — resolution, ISO, and brightness. All these characters together affect how well the objects appear on the TV screen. You also need to check for contrast, which you can change later but it is better to check the feature beforehand. Every product has a fixed lifetime. The way you use it can decrease or increase product life. 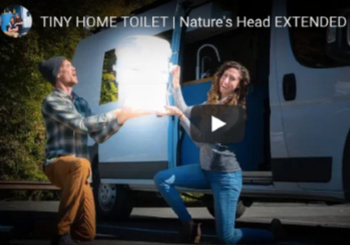 If you are planning to make the RV your permanent home, you might want to invest in a good brand that offers highly durable products. It is going to be expensive but worth in the long run. The RV television you choose should have at least one USB port and support HDMI cables as well. If you document your life and want to transfer data from the PC to the TV, you might want a PC port. These three connections will be enough but if you want to go over-the-top, you can look for VGA, WVGA, and RCA connections. It will cost you more, so make a practical decision. The TV should be wide enough to give you a comfortable viewing experience, but also should be easy to move around. Don’t compromise on the price because it will affect the product’s quality. 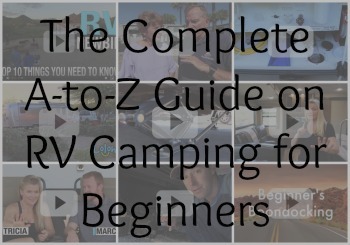 A good RV TV with all these features will cost you anywhere between $200 to $500. A good warranty policy will rise the cost a little. 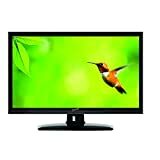 SuperSonic 1080p LED Widescreen HDTV is an affordable product available in a variety of sizes from 13” to 40”. However, the best one for RV use is the 22” model. It is AC/DC compatible and has HDMI inputs, which offers a wonderful viewing experience. The TV is also USB-compatible and has a PC input, so you can use it view photos and videos on a bigger screen. You can use the PC input to use the TV as a computer. Other features that it comes with include noise reduction and color balance. It has a brightness of 250cd/m². The TV has a resolution of 1080p. You will receive a 90 days parts warranty on the product. Jensen is one of the few brands that make televisions for RVs and motorhomes. The JTV3217DC model is designed to suit the modern interiors of RV homes. It comes with an industrial grade metal cabinet. It has a 12V operation, front controls, and front firing speakers. The 32” television has an LCD panel aspect ratio of 16:9. It has reinforced mounting points and is energy efficient. You will get a wireless remote to control the television and DVD player with this product. The TV has an HDMI input, one RCA input, and one USB input, all of which you can use for a superior entertainment experience. Available in 16” and 24” sizes, the Sceptre TV DVD Combination has a resolution of 720p. Along with the in-built DVD player, the RV television also has an HDMI input and USB port. Sceptre has over 30 years of experience and is known for its superior quality products at affordable prices. The clear audio quality and high definition video quality makes the TV-DVD combo a perfect product for your RV. You will still need to buy an HD hook up the cord for better audio because you will be traffic, which can interfere with the sound quality. It doesn’t have any cable input, so it is strictly for watching movies and TV series using CD/DVDs. However, you can use a fire-stick with it to stream YouTube videos and Netflix programs. Compatible with fire-stick to stream Netflix and YouTube videos. Another Jensen model on the list, the Jensen LED TV works in three resolutions — 1080p, 720p, and 480p. It has a wide color range of over 16.7 million colors. The TV comes with a rugged metal cabinet, which offers extended protection. It has a front control panel to change channels conveniently. The package includes a fully functional wireless remote. You can use the TV’s HDMI input to play video games on your PS4 and Xbox, USB port to view photos and videos on the screen, and VGA input to convert into a computer for editing videos and photos on a larger screen. When you purchase the product, you receive a 60 days free tech support and a one-year warranty from the manufacturer. The 12-volt TV also has a headphone output, the brightness of 200 nit, and a contrast ratio of 3,000:1. Contrast Ratio: 1000:1;Dimensions measured in inches: 22(W)×7.5(D)×15.5(H) - with Stand ; 22(W)×3.5(D)×15(H) - without Stand. With a wide display range of 16.7 million colors, this HD TV/DVD Combo is a great steal. It has an aspect ratio of 16:9 and supports maximum resolution 1366p x 768p. Input terminals include one CVBS and audio input, one PC audio input, one cable/antenna RF input, SD card terminal, and USB port. It comes with a fully functional remote control and works perfectly when connected to your RV’s battery. It comes in two sizes — 24” and 32”, both of which have a contrast ratio of 1000:1. One of the most affordable TV/DVD combos on our list, TVD1804-24 is perfect for playing games and watching movies. It comes with a wall mount frame if you want to mount the TV on one the walls. The TV foot is easily detachable. You will get a one-year limited parts warranty from AXESS on this product. This 1080p LED HDTV is our favorite out of all the many options of RV TVs. It is AC/DC compatible, has excellent color balance, and offers a special noise reduction feature. It is available in multiple sizes from 13” to 40”. 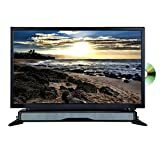 The TV is affordable and has a PC input, which you can use to turn the TV into a computer. The large screen is perfect for late night movies and viewing trip photos.